So we felt the strings needed a context to help the students attach their thinking to a real world dilemma. So with this string we resorted to a quick context of food — who doesn’t love food? A pan of brownies, a sheet cake, a pan of rice crispy treats. These contexts were chosen because they reinforce the array model, which the students had a foundation in when they learned about multiplication of whole numbers. We wanted to encourage kids to imagine the pan (an array) and the cuts before we began to model it for the whole class. Once we gave kids the chance to do this, we asked a student to describe what they were picturing. 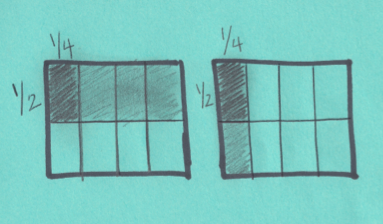 When sketching for the whole class we were very aware of shading or drawing lines to really visualize 1/2 of 1/4. For example, we may draw small horizontal lines for the 1/2 then shade with diagonal lines for the 1/4 portion to show the overlap. Instead of asking students to envision the pan, you could have the students try to make a quick sketch, share with their partner, and then defend their model to that same partner. Meanwhile, you are circulating the room for interesting examples/thinking to share. You can assess and judge based on your students how much guidance your students will need with the rest of the string. For example, you might see these two sketches of 1/2 of 1/4. The one on the left shows 1/4 of 1/2, while the one on the right shows 1/2 of 1/4. Though the product is 1/8 in both, one doesn’t represent the context that the class is exploring. So in this way, they are worth putting up for the whole class to see to determine which one makes sense given the story. Could they both be correct? Why or why not? Which one show 1/2 of 1/4? In this string all number sentences begin with 1/2 because 1/2 is a landmark that is easy for kids to wrap their heads around. The ‘of’ is intentional to help link the context to the visual and use of model. Later you can replace the word of with a multiplication sign in a new string, asking if there are any contexts or situations that would help them make sense of multiplication problems like 1/2 x 1/5. We are hoping, of course, that students have enough experience with the context to say, “Yeah, we could think of it using the pan of brownies.” The first two examples were chosen to tap into the common knowledge students may have about halves, fourths, eighths and then later the string moves into thirds, sixths and twelfths. If you wanted to, you could end the string with a challenge like 1/2 of 2/3 or 1/2 of 3/4 to really get them thinking. We see this string as the first step in slowing down their process — a rush to just get the answer — and linking it to a context and model. My normal approach when dealing with fractions is to visualise the quantities involved. It is difficult to do that for some topics, and I think that multiplying fractions is one of those topics that is difficult to visualise. You’ve made a great start here though! Thanks!